Shown here is Aquanaut Lloyd Godson in his habitat underwater in Australia. As of this post, Lloyd is in his eighth day underwater on target to complete his remarkable 14 day mission. Lloyd’s mission is the first to use a bioregenerative component in his life support system, the algae system shown to his right. The coil shown is the light coil that spins the algae broth around a light. It is then returned to a mixing tank where Lloyd’s carbon dioxide is mixed and absorbed by the algae as the algae photosynthetically evolves oxygen into Lloyd’s air. It is the first time on a habitat mission that such a component has been plugged in and used. 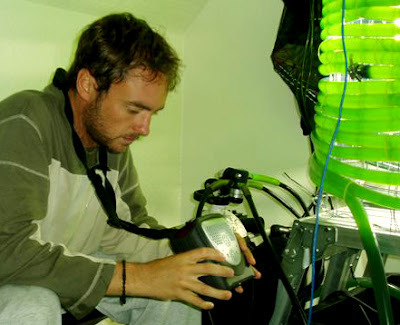 Many aspects of Lloyd’s life support system are also planned for inclusion in the Atlantica I mission in 2009, including perhaps the algae system. Much depends on Lloyd’s data stream, which, we hope he shares. Lloyd seems surprised at the level of attention he has been receiving. It has demanded a good slice of his time in the habitat and he is connected with either schools or reporters for most of his heavily scheduled day. Only five days, 22.5 hours remain in his fascinating mission!